My husband asked for a helmet and goggles (for four wheeling) for his birthday so in order for him to still have a surprise to open on his birthday, I made him this tool tote which should come in handy when he is working on cars. Typically when he works on cars, I walk out to his shop and there are tools everywhere and it never fails that he is always looking for one wrench or socket in particular and he can’t locate it. I’m hoping that between the magnetic bars and the walled compartments, it will help keep his tools visible and within reach. This was a really simple project and is definitely something that a beginner can tackle. So if you are looking for something to make your Honey this Christmas, keep this project in mind. It’s a great way to organize wrenches while working on a project. I found the above photo on the Family Handy Man website and could instantly see how practical it was. 1) I went through my scrap wood and found some 3/4″ plywood and made a base that measured 12″x 11 3/4″. You can, of course, change these dimensions if you want. 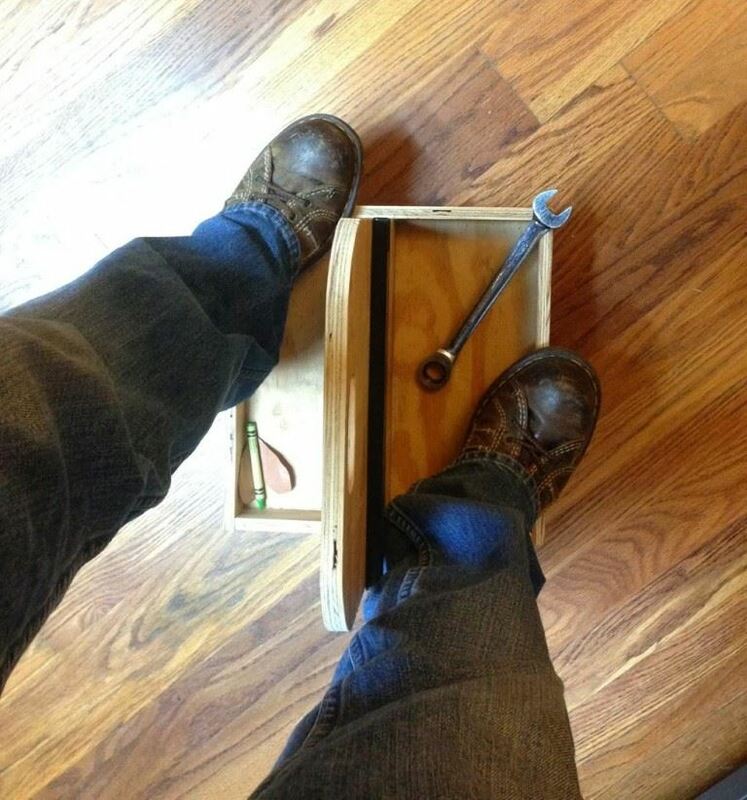 I grabbed a couple socket wrenches and hand wrenches to determine the size of mine. 2) Next I used 1/2″ plywood to cut the side walls. Again, using tools to determine the height, I laid a socket wrench down and determined a 2″ high lip would keep the tool in the compartment, but it was also low enough where a mechanic laying on his back will be able to see which tool is where. 3) Now I sanded everything real good then used wood glue and clamps to put the walls up. Then, because tools will be getting flung at it, I went back through with my nail gun and put in 1 1/4″ nails. And now we have a base. 4) For the divider I grabbed my 3/4″ wood again and cut it to 12″x13″. 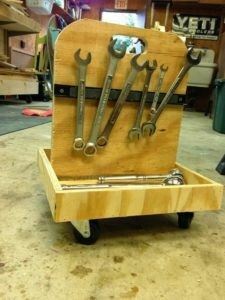 I settled on 13″ high because it was the minimum height I could use where the wrenches would not interfere with the bottom compartments or the handle, but still allow the tote to go under a jacked up vehicle. 5) Then I used my jigsaw to lop off the corners and make them round. Great, time to attach it. If you are using the same dimensions as me, then you need to come in 5 1/2″ to make the divider split middle. 6) To secure the divider in place, I first used my brad nailer to kinda tack it in where I wanted it then went back with two 1 1/2″ wood screws on the bottom, and two 1 1/4″ wood screws on the sides. Tip: I first drilled a pilot hole then came back in with the screws. 8) I used my scroll saw to cut it out but a jigsaw would also work. Note: To make a cut in the middle of a piece of wood, first drill a hole (with a 1/4″ drill bit or larger) somewhere in the center then use the jigsaw to cut the remainder. I bought this set of three magnetic bars as well as a magnetic socket set holder at Northern Tool. So I wouldn’t have to buy two, I planned on cutting down the 18″ bar but that didn’t work, so I just used the 12″ and the 8″. If you want yours to be identical then buy two sets and only use the 12″ bars. The socket holder came with four magnets on the back and since I didn’t need them I took a putty knife and hammer and just removed them. 9) I attached the socket holder to one of the compartments then the two magnetic bars to the divider, using 1″ wood screws. 10) Last thing was to add the casters. I found these, which hold up to 175 lbs, for $1.50 at Walmart. I screwed them in with 1″ screws then called it done! Yeah…that’s him standing on it. lol, This is why I can’t have him in my shop while I’m building something. He has so much confidence in my skills that his tests are always so extreme!…but I’m very pleased that it passed (and no, I don’t have any idea why there is a crayon in his tool tote).